William “Mack” McAllister has a multi-million dollar idea to make the world a better place. His popular workplace wellness app, TakeOff, delivers exactly what you need to improve your mood and sense of well being during the work day, from a funny meme, to a song, to instructions for taking an active break. He envisions a world in which technology can help people take control of their own happiness, and he encourages TakeOff employees to live by the same philosophy. Meanwhile, he’s lying to investors about his roadmap, losing top hires, and is being investigated by a young reporter for sexual harassment. 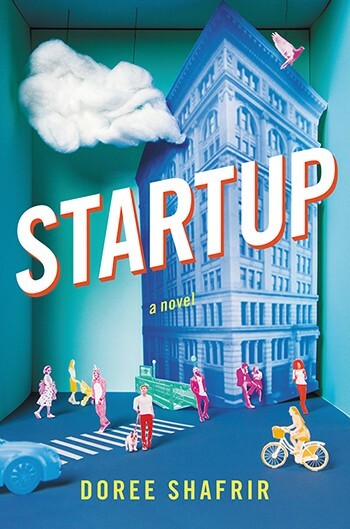 Mack is a central character in Doree Shafrir’s debut novel Startup, a satire about the New York tech scene that pulls no punches when it comes to inconsistencies between the rhetoric around humane, supportive office culture and many workers’ realities. A senior culture writer at BuzzFeed and alum of Rolling Stone, Gawker, and others, Shafrir talked to Slack about what motivated her to confront these issues in her first work of fiction, and what she hopes readers will take away from it. Slack: There’s a big difference between Mack’s altruistic vision and the way he thinks about other people as tools or annoyances in his own ambition. When you were creating the character, what did you think was really driving him? Shafrir: The thing that I wanted to be clear about is that TakeOff is not a source for evil. Ultimately, his intentions are decent. He wants people to be happier in general, but the way he thinks that can happen is very naïve and misguided and one-size-fits-all, which I think is a common mistake that people in Silicon Valley make—that what works for a 28-year-old, single, white, privileged, male tech founder should work for everyone. Slack: Reminds me of the scene where he shuts off his own app because it makes him feel worse. Slack: Your character Dan is a tech journalist who sees himself as the opposite of the Macks of the world, but is hitting on his own young reporter and doing other exploitative things. If you had to give one moral or lesson to this book, what would it be? I think Dan is actually the most un-self-aware character in the book. He sees himself as a really good guy who is speaking truth to power. A theme that runs throughout the book in not just Mack but also Dan and other characters, is practice what you preach. You see so much of this, people saying one thing but then when it comes to how they actually conduct business, it’s a total different story. Slack: Sexual harassment, and the way that women in tech and tech journalism are treated in general, is a major theme in the book. Did anything specific motivate this? Shafrir: There was a lot of stuff in the air around the time that I started the book in early 2015. The Whitney Wolfe Tinder lawsuit had just been settled in November 2014, then the Ellen Pao trial started in February. And both had been in the news for a while. It’s not like I thought we’d have this all figured out by the time my book came out, but I naïvely felt it might feel dated. I wanted my book to be zeitgeisty but maybe not this zeitgeisty. Evie Nagy also went from working at Rolling Stone to writing about tech culture, which she is now far more likely to call a “pivot” than she used to be.